A host of technical specialists—geographers, geologists, hydrologists , oceanographers, and others—studies the water components of Earth's surface from various points of view. Some of these professionals hold B.S. (Bachelor of Science) degrees in their chosen fields, while others hold graduate-level degrees—either M.S. (Master of Science) or Ph.D. (Doctor of Philosophy). In the last few decades, with the rapid growth of geospatial technologies such as remote sensing , the global positioning system (GPS), and geographic information systems (GIS), the work of these specialists has become increasingly interwoven with that of professionals in the information sciences, including programmers, statisticians, and mathematicians. Most work that makes use of quantitative information about water resources today involves interaction with GIS, which are computer databases dedicated to geographic information. GIS unifies or integrates information from many different sources—geology, biology, satellites, ground observations using the GPS, traditional surveying, census data, and others—and make it available in meaningful forms to a wide variety of users, including engineers, scientists, facility managers, resource planners, lawyers, urban planners, and the military. Data-gathering for GIS is thus a diverse field in itself. Other GIS specialists, such as GIS managers, database administrators, systems analysts, and computer programmers are required to make each system work. Many of these persons have undergraduate or graduate degrees in computer science with an emphasis on data structures, or in geography with an emphasis on GIS. Those involved with the electronic, aerospace, and other mechanical aspects of geospatial technology (e.g., satellites, aircraft, and sonar) usually have at least B.S. degrees in physics or in electrical, mechanical, nautical, or aeronautic engineering. Many job openings for GIS technicians and specialists call for candidates with B.S. degrees in geography with a GIS emphasis. 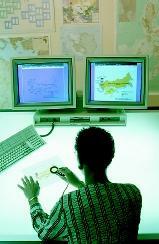 Professionals involved with the information-processing and engineering sides of GIS, GPS, and other geographic information technologies usually work in offices or laboratories, and spend much of their time interacting with computers. Those whose direct concern is with the understanding of the Earth's surface, such as geologists and hydrologists, may spend much of their time at sea, in the air, or on the land in quest of samples, observations, measurements, and other data. For these scientists, periods of data-collection generally alternate with periods of analytic deskwork involving computers. The federal government conducts research in many aspects of hydrology, ocean sciences, and water resource management. Resource mapping, environmental management, climate modeling, and weather prediction are among the activities carried on at the federal level. In the computer age, the cartographer's role has become increasingly technological in nature as they work with geographic information system (GIS) software to generate maps and perform environmental analyses. With the inputs from satellite data, the global positioning system (GPS), and remote sensing, maps can be digitally rendered with great precision and detail. responsibilities of these organizations include flood control, pollution control, highway planning, the protection of drinking water, the generation of hydroelectric power, and many other water-science tasks. At the local and municipal level, community water and wastewater services must be provided. There also are many private corporations specializing in water resource work, often on contract to government bodies. All such organizations, both governmental and private sector, hire staff with degrees in hydrology, geology, geography, geophysics, and geospatial technologies. Internationally, the United Nations, the World Bank, and most national governments also fund departments or ministries to oversee water-related ecology problems and water resource management. The U.S. Department of Labor's Bureau of Labor Statistics states in its Occupational Outlook Handbook (2002) that "employment of environmental scientists and hydrologists is expected to grow faster than the average for all occupations through 2010, while employment of geoscientists is expected to grow about as fast as average." In other words, job openings for professional environmental scientists devoted to the understanding and control of pollutants , waste disposal, water supplies, and the reclamation of contaminated resources will grow faster than average, while those for geoscientists who study the composition and structure of Earth will grow at the same rate as most other professions. B.S. degrees in earth-science subfields of physics or in geology suffice to enter some job tracks, but better jobs and more of them are available to those with M.S. or Ph.D. degrees; most entry-level environmental science jobs require a bachelor's degree (or higher degree) in hydrogeology, geochemistry, environmental or civil engineering, or geography. SEE ALSO Data, Databases, and Decision-Support Systems ; Geospatial Technologies ; Land-Use Planning ; Oceanography from Space ; Sound Transmission in the Ocean . Lo, C. P., and Albert K. W. Yeung. Concepts and Techniques of Geographic Information Systems. Upper Saddle River, NJ: Prentice Hall, 2002. GIS Jobs Clearinghouse. <http://www.gjc.org/> .